1)Before you plan a wine and cheese party at home, what are the basic things that one should keep in mind? Well to begin with how many people are coming, making sure you have enough wine glasses, decanters, cheese boards, cheese knives and accompaniments to go along with the cheese and wine like crackers, olives, balsamic vinegar and select fruit. 2)If it’s a wine and cheese party, what should be the host’s perfect shopping list? Lots of wine and cheese to begin with ! different styles of wine and an assortment of cheese. 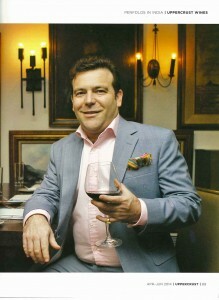 I like to open up a range of styles – 2 to 3 reds, a rose´, some sparkling and 2 to 3 whites if I have enough guests. This way everyone has get their style of wine that they prefer, everyone can experiment and move from one wine to the other and also because a variety of cheese will be served, there will be a wine that is simply delicious with that cheese instead of doing an assortment of cheese that has to go with one or two wines. I’m a stickler for glassware so ensure you have the right glasses. I also think decanters not only help in opening up the wine but look fantastic on any table. A couple of decanters in different shapes will make that table even more inviting. 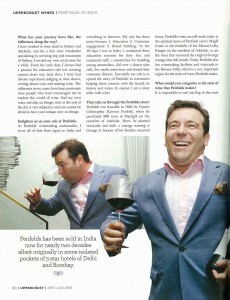 3)What are the absolute must-have wines that one should stock? That’s a very personal choice since one persons taste will differ from another but generally , Champagne and or high quality sparkling wine. Red, rose and whites from all over the world showcasing a range of varieties, a couple of dessert wines. A few top end wines from those special occasions or if you’re like me then top end wines for today. If stocking wine at home then invest in a wine fridge, not only does it look super but will help you maintain the quality of your wines in the right way. When I have guests from out of town I usually pull out my stock of favourite Indian wines just to show what we can do here as well. 4)Which wine goes with which cheese? All of them. The world of wine and also cheese for that matter is just so large that there is always a wine to go along any kind of cheese. Keep in mind that wines with high acidity, Sauvignon Blanc or sparkling wine for example will go with softer cheeses, wines in high tannin structure will go with hard cheeses. Pair semi hard cheese’s with medium bodied wines. Don’t be afraid to experiment. Instead of trying your favourite blue cheese with a sweet wine which works wonderfully, also try with a full bodied tannic red and see if that works for you, you might prefer it. 5)When you are choosing your wines, what are the aspects that you look for? I like to experiment with wines I have not tasted before so I am looking for something new. Perhaps a new grape variety, producer or region I have not come across before or experimented with enough. But when entertaining its important to make sure that your guests aren’t the guinea pigs unless they themselves have a thirst for experimentation as well. 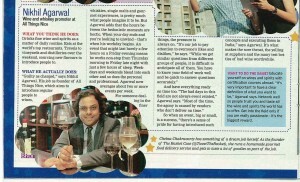 I generally keep a few crowd pleasers and also a couple of wines that I know will be completely new to everybody. 6)What’s your secret mantra to be a perfect host? Really simple. Be warm and hospitable and make sure your guests glass is always full. 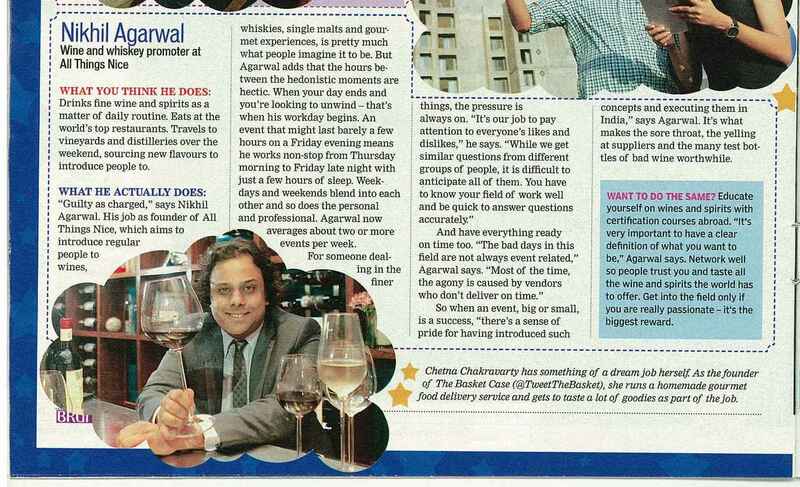 Nikhil Agarwal, Director and Sommelier of All Things Nice features in the article ” Living The Dream” in HT Brunch. 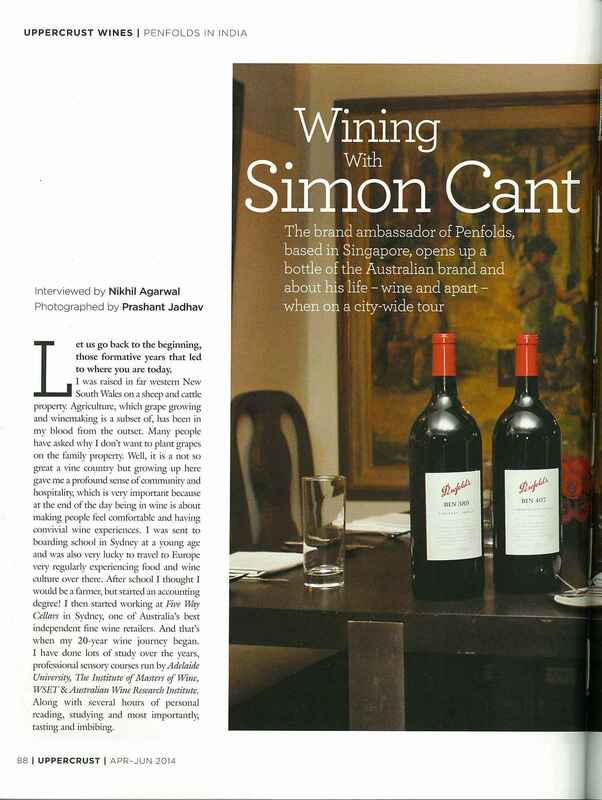 Nikhil, Director and sommelier of All Things Nice interviews brand ambassador of Penfolds, Simon Cant for Upper Crust magazine. 1) Share the history of sangria. Classically, what were the ingredients used? Any back story of how it became popular? The Romans planted vines in Spain for making wine. Red wine was used to make Sangria originally along with fruits, spices and brandy. Two probable reasons it became popular, at that time water was not safe to drink and wine was drunk since it had alcohol in it to keep diseases at bay. This way of drinking wine was cooling and refreshing and became popular in the hot Spanish summers. Tourist coming into Spain or Portugal for that matter flocked to drink Sangrias and took the concept back to their own countries where they became quickly popular as well. 2) What is the process of making sangria? Please answer in detail, how the fruits are fermented any particular sizes? To start with, put together a good red or white wine, fresh fruits depending on what sangria recipe your following, fruit juice and brandy for making a good Sangria. The better the ingredients the better the sangria. I’m not saying buy an expensive bottle of wine, just a wine that you would not mind drinking on its own. Also keep the mix together in a bowl or jar for sometime to allow the flavors of all the ingredients to come together. Keep in a fridge to make it cool. Use sugar or simple syrup, or juice concentrate ( from Monin for example) as per desired sweetness or flavour. Try sparkling wine to top of the mix in the glass to give it a little zest if you like. 3) What wine goes best with what fruits-ingredients? Wines like Chenin Blanc, Riesling or Viognier that have either very tropical fruit or floral notes go with the fruits used to make Sangria. In reds try medium bodied wines from grape varieties like Merlot and of course Tempranillo. Don’t use wines with too much oak or any oak at all. 4) Can you tell me a little about the red and white wines which are favorable for making sangria? You mentioned brandies too right? Some people believe that the quality of wine is not important as so many other ingredients are used. But for a good tasting Sangria one must use a wine that tastes good on its own. Fruitier styled wines whether red or white work well. 5) What type of food is enjoyed with sangria? Sangria is not a serious drink for food pairing. Enjoy it own its own or with appetizers and forget about the pairing bit. 6) Did sangria earlier meant to be a ladies’ drink? No I don’t think so. It’s only in our whisky soaked Indian minds that we think lighter style alcohol beverages are for the ladies. 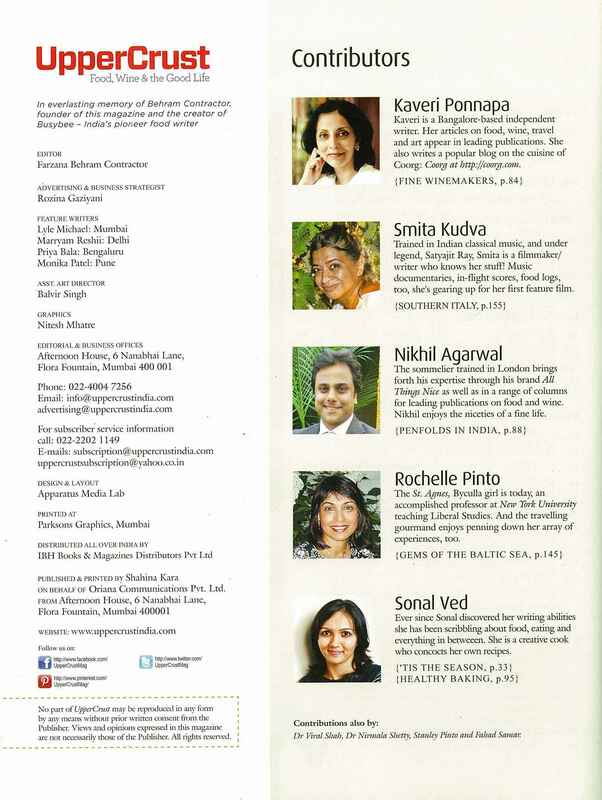 7) Discuss the contemporary flavours used today? Some restaurants have peach and blue berry sangria… Comment on the popularity of sangria’s. 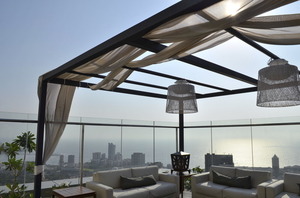 Sangria is becoming extremely popular in India. 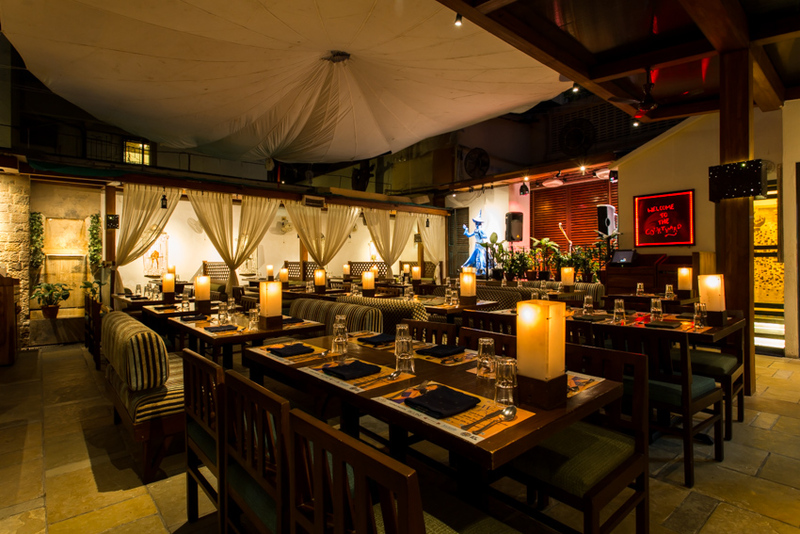 Pali Village Cafe in Bandra put in on the map and other restaurants have fabulous promotions working towards getting people to drink Sangria. 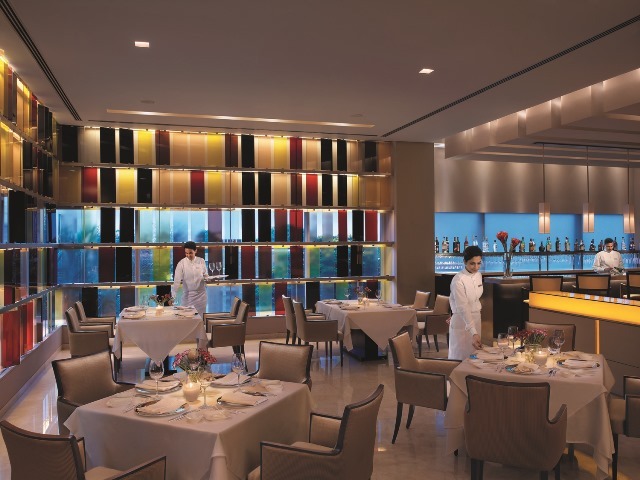 Each restaurant or bar has their own version and the forward thinking ones are experimenting with new styles as well. 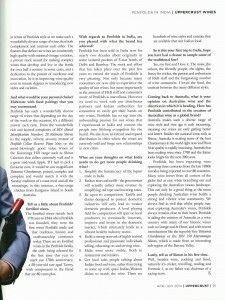 It’s hot here in India so I’m not surprised that Sangria has taken off, plus its also a starting point for some people on their journey to drinking wine which itself is getting very popular. 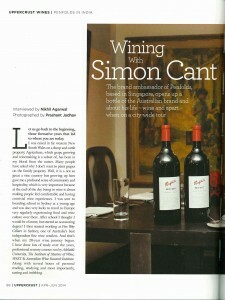 An extract of the article written by Nikhil Agarwal in Vogue Food & Drink Guide. 1. Why do you think patrons are preferring flavored mojitos over regular mojitos? Because woman today are looking for something new and are constantly experimenting to find the the next new thing that they like. 2. Could you give me 3-4 examples of such a change in drinking preferences? I think wine is becoming extremely popular these days, specially when it comes to lunches whether done socially or for work. There is also a cocktail revolution going on and I see women looking to try new powerful cocktails on a night out with the girls. At the same time I see a serious fondness for whisky and single malts on nights out with the girls or in general. 3. What do you think are the new Sangria and Martini? – New Sangria – Sangria’s are relatively new to India on a larger scale and do really well at Sunday Bunch or sun downers but I think Prosecco or well made Indian sparkling wine is going to be a trend in the future for Sunday brunch. 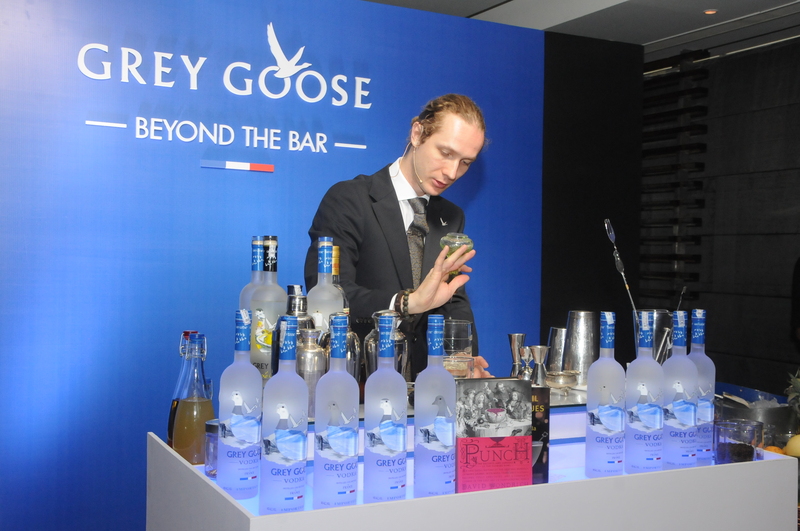 A couple of All Things Nice members and us went to Asilo a few nights ago on invitation from Asilo’s Sanam Sippy and Grey Goose. 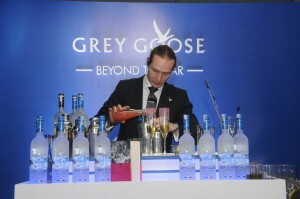 We were there to taste cocktails prepared by internationally renowned bartender Ondrej Pospichal for Grey Goose’s Beyond The Bar programme and to indulge in Asilo’s ambience and food. 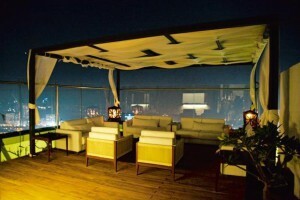 Situated on the top of the Palladium hotel, Asilo is Bombay’s highest bar and is truly spectacular. Any night with a seven drink minimum on the itinerary is destined to be a fun night. 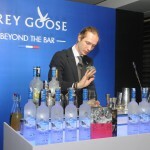 Ondrej went on to present his ‘Signature Seven’, a series of seven cocktails made especially with Grey Goose, inspired by spices available at local markets. 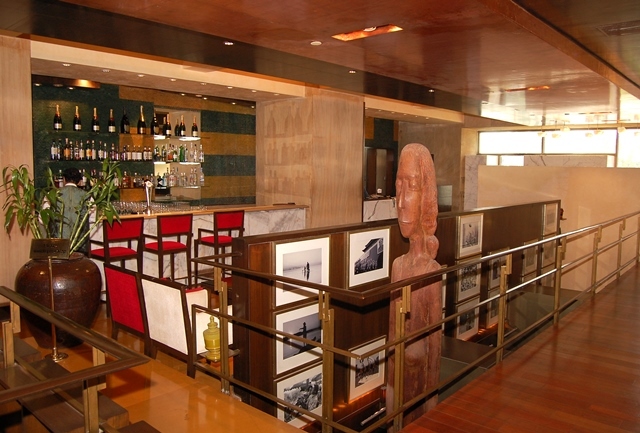 One of the cocktails was named after the capital city, ‘New Dilli’, inspired by the DilliHaat souk where different flavors of India blend in. Nope, no drink named after Bombay but we forgive him. 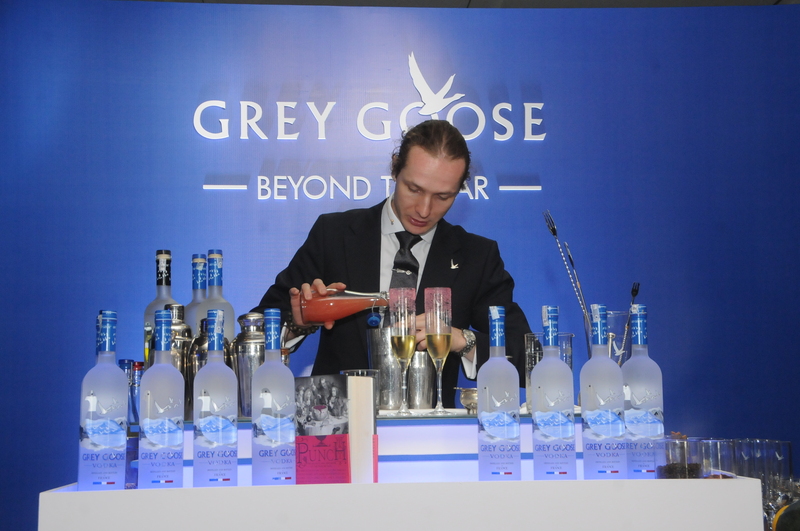 Programmes such as Beyond The Bar are super because it gives bartenders in India training to be creative with cocktails and flavors which are different from the usual concoctions some of which we are getting tired off. Folks I could go on about the drinks and food but you’ve got to go to Asilo for yourself and soak it all in, my personal favourite was the New Dilli and the Martini (my 8th drink, on my 9th I attained what I call “The Wisdom”) that Ondrej made specially for me. You can try making them on your own if you like, see below for how…Happy Drinking…. 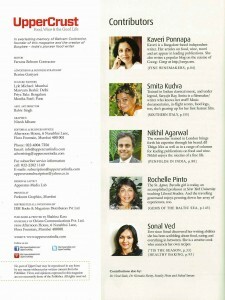 Nikhil – All Things Nice. Inspired by the DilliHaat souk where different flavors of India blend in. the same way, this cocktail will take your senses on a journey where popular flavors of India like fresh dill, celery, fennel seeds will add distinct native flavor. A French based pre-dinner cocktail inspired by the liking of James Bond. Infused with the strong and aromatic tonkabean which adds a hint of sweetness on the palate and leaves a refreshing sensation. A cocktail which defines your personality by the choice you make between sparkling wine, tonic water or soda. Instilled with fresh sage, softened in white wine it complements the bitterness of Campari and silkiness of Grey Goose vodka. Every ingredient in this cocktail gives your sense of taste of taste an imaginative run. A heartfelt blend of Grey Goose, tequila, honey water and green cardamomwhich is not so sharp on the palate but surprisingly sweet in the end. The world at your table. This cocktail brings together different varieties of chocolates from around the world. With a hint of peach and coffee flavor, you are sure to experience the finesse across your palate. The name says it all. A refreshing mix of cocktail made with pineapple-coriander syrup, lemon juice and some freshly picked coriander leaves to garnish it. Very sophisticated welcome drink to suit any occasion and time of the day. A signature blend of five hand-picked spices (cinnamon, stevia, peppermint, grapefruit & black tea) is combined with the exotic flavor of Assam tea. 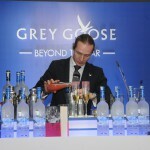 Infused with Grey Goose vodka, this concoction is mixed with Agave and white grapefruit which makes it the best seller cocktail. 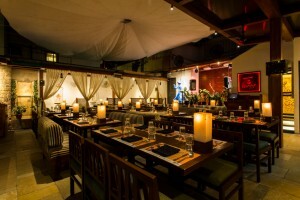 A favorite watering hole of locals and expatriates alike, Opium Den is an ideal getaway for comforting afternoons or fun filled evenings with pours of signature martinis, daiquiris, classic cocktails and a premium selection of wines and spirits. 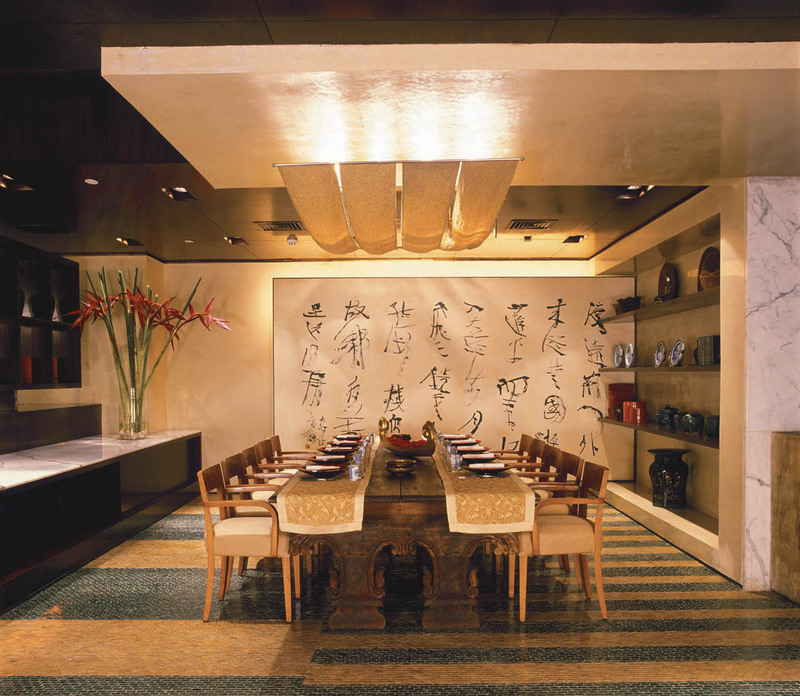 Note: Opium Den is only offering their wine list at 30% off, for set course meals you could visit India Jones or Vetro at the same hotel.